NetControl.net Archive of :: Alpine Moves You! Discover the Future of Mobile Multi-Media! You have accessed the center of mobile electronics technology and application. All of us at Alpine are pleased to talk to you through interactive media and look forward to communicating with mobile electronics enthusiasts everywhere. Find out what's new at Alpine by checking out our Alpine News information resource. Learn about the history and acheivements of Alpine through the Alpine Story archives. Are you interested in what new products through the Alpine Story archives. 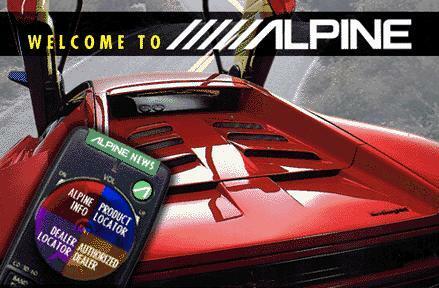 Are you interested in what new products Alpine has? Click on the Product Locator and find the exact component that is right for you . And if you want to connect with your nearest Alpine speciality retailer, use the Alpine Dealer Locator to find their name, address, phone number and home page. There's also a few suprises, so do your best to explore our entire site. And find out why Alpine is what the future sounds like! 19145 Gramercy Place, Torrance, California 90501, U.S.A.
× The word "Dolby" and the "Double-D" symbol are trademarks of Dolby Laboratories Licensing Corp.
× The letters "BBE" and the symbol are trademarks of BBE Sound Inc.
× Product descriptions are based upon current information at the time of printing, but complete accuracy cannot be guaranteed. All designs, features and specifications are subject to change without notice.